Lingo specializes in residential VoIP service for nationwide and international calling. They don’t have the type of service that would suit businesses. Lingo offers most of the standard features such as voicemail, call waiting, speed dial and call blocking. You get to keep your phone number and use your existing Internet connection. Features that require additional charges are fax capabilities, enhanced 911, virtual phone number, among others. There are no bells and whistles to be had in the Lingo VoIP service – just a straightforward capability to make calls using your broadband connection. Installation – Lingo offers free activation, and free equipment, which in itself is a very basic piece of plug and play type of hardware. Plans – They have flexible plans based on whether you want unlimited nationwide and international calls. Pricing – The lowest price tier of Lingo offers a low rate of $9.95 per month and no contractual obligation. No Softphone – You will have to bring your adapter with you when you travel to make calls since Lingo doesn’t offer softphone capability to allow you to make calls from your computer. Customer Service – Lingo is not known to have reliable customer support channels so customers will have to rely heavily on their website for general FAQs. Call Quality – Lingo is one VoIP provider that has several reports of having inconsistent and average call quality. 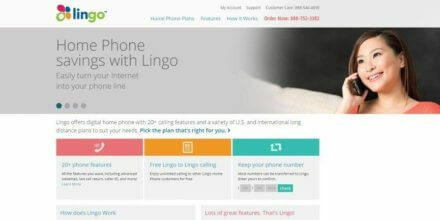 Lingo’s nationwide plans start out at $9.95 per month inclusive of over 20 features and 500 minutes of domestic calls, as well as to Canada and Puerto Rico. Meanwhile, just as the name suggests, Lingo Unlimited offers limitless nationwide calls including Canada and Puerto Rico. There are two options under this plan. One charges $19.95 with no contract, and the cheaper option of $14.95 with a 1-year contract. Lingo’s International plans are subdivided into three options and are based on the number of countries you can call using your unlimited minutes. Lingo World: $19.95 per month with a 1-year term contract and the no commitment option of $23.95 allows unlimited calls to 50+ landline countries and 15 mobile countries. Lingo World Plus: $24.95 per month with a 1-year contract and the no commitment option of $29.95 allows unlimited calls to 70+ landline countries and 25 mobile countries. Lingo World Ultimate: $39.95 per month with a 1-year contract and the no commitment option of $44.95 allows unlimited calls to 90+ landline countries and 55 mobile countries. There are differences in sound quality between all of VoIP providers, some more pronounced than others. Lingo’s call quality shows some inconsistencies like louder-than-normal background noise and static. For some consumers, however, this may not pose as a big deal breaker especially for those who want to take advantage of their unlimited international calling feature. Lingo offers a small feature set compared than other providers, but they do provide the basics like call forwarding, speed dial, three-way calling, and voicemail. Some of the services offered for free by other providers come with a fee with Lingo: Mobile add-on service, toll-free number, and a fax line to name a few. Customers looking for more advanced features and more value for money may have to look elsewhere. This is the part wherein users have to read the fine print on their service agreement with Lingo. Essentially, they don’t offer a free trial or a money back guarantee, but should the customer wish to terminate or cancel the service, this may be done at no extra cost, except for an equipment recovery fee of $75 if the hardware or adapter isn’t properly returned. It’s a slightly different term for customers signed up for plans with contracts. Should they decide to terminate or cancel service before the chosen twelve or twenty-four month term, an early termination fee of $175 will be billed to the customer, as well as applicable equipment recovery fees. It would be important to note that activation starts from the time the customer signs up for the service, not when they receive and link up the equipment. One of the important aspects of what customers should look for in their VoIP providers aside from call quality is the ease of setting up and linking to the service. This is the part where Lingo is able to deliver, in terms of the ease of use of their equipment. The lease of their adapter is free, while delivery and activation are free as well. The Lingo adapter itself is slick and packaged nicely, and best of all, it’s a cinch to install. If you’re a customer with minor issues about your service, you’re better off trying to get some answers online first. They have useful FAQs, feature guides, and supplemental installation information on their website. Their tech support is outsourced and may at times be difficult to reach. Otherwise, you have DIY (Do It Yourself) options on their portal where you can manage the settings on your voicemail and calls. What's the Verdict on Lingo? The Lingo VoIP residential service is adequate for nationwide and international calling. If it’s the essential features and functionality of a residential home you’re looking for, then Lingo can deliver. They’re showing signs of expanding their features to accommodate advanced needs like mobile apps, but these efforts are limited as well. They only have mobile apps for Blackberry (which is going by way of the dinosaurs) and Android. In the end, there are other VoIP services out there that have comparable rates with Lingo, but provide more bang for your buck.